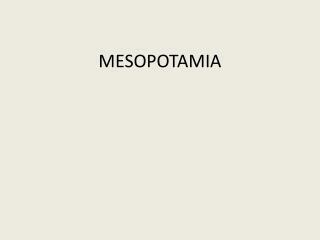 Mesopotamia Mesopotamia Mesopotamia is at the eastern end of the Fertile Crescent, an arc of land from the Mediterranean Sea to the Persian Gulf. 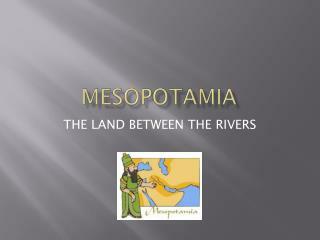 Mesopotamia (“between the rivers”) is the valley between the Tigris and Euphrates Rivers. 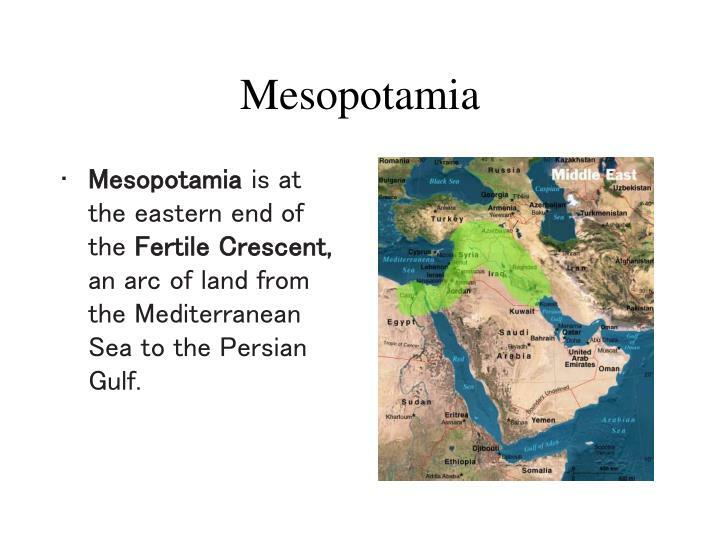 Mesopotamia is at the eastern end of the Fertile Crescent, an arc of land from the Mediterranean Sea to the Persian Gulf. 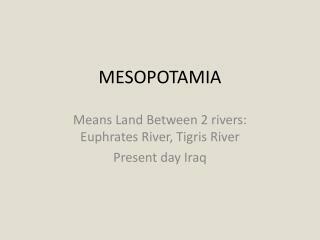 Mesopotamia (“between the rivers”) is the valley between the Tigris and Euphrates Rivers. 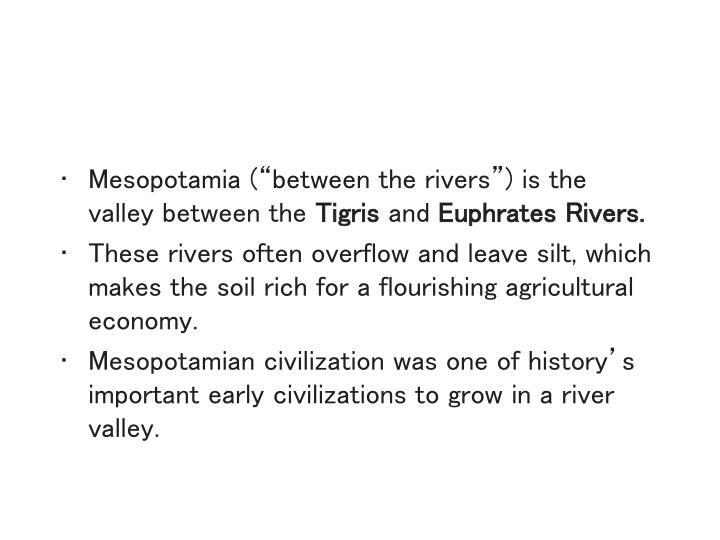 These rivers often overflow and leave silt, which makes the soil rich for a flourishing agricultural economy. 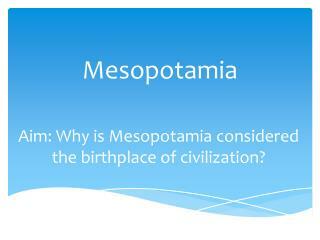 Mesopotamian civilization was one of history’s important early civilizations to grow in a river valley. 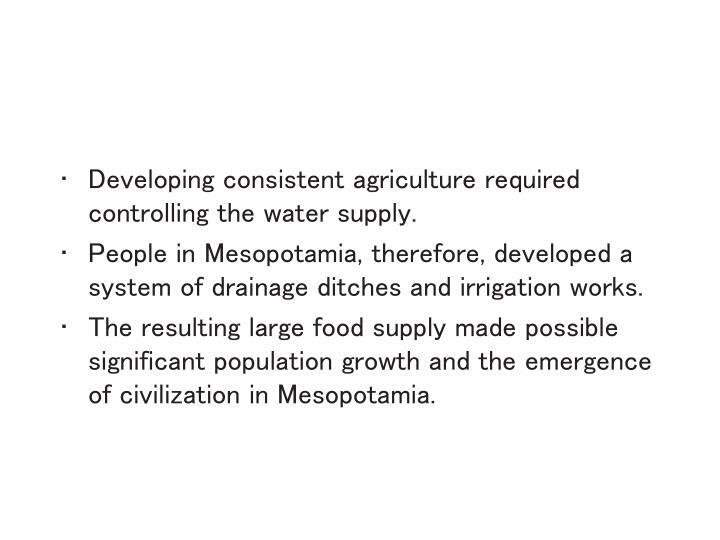 Developing consistent agriculture required controlling the water supply. 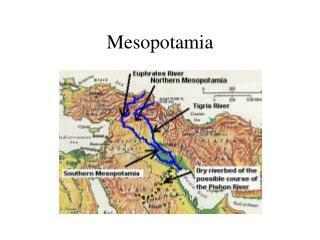 People in Mesopotamia, therefore, developed a system of drainage ditches and irrigation works. 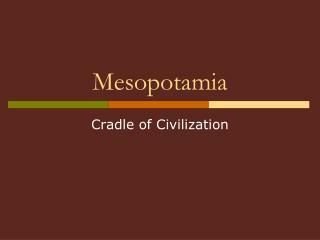 The resulting large food supply made possible significant population growth and the emergence of civilization in Mesopotamia. 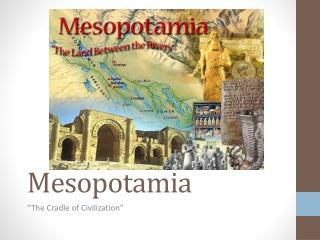 Mesopotamian civilization involved many peoples. 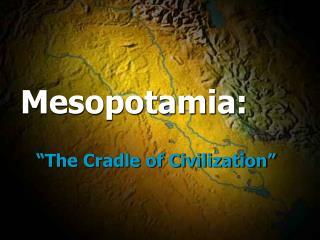 The Sumerians developed the first Mesopotamian civilization. What role has geography played in how Orofino has developed physically, culturally, and economically? 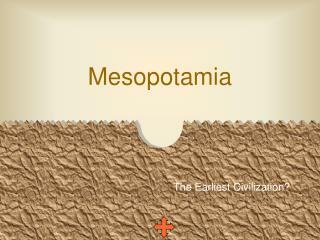 By 3000 B.C. 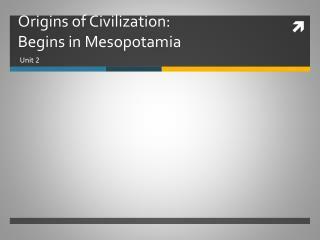 the Sumerians had formed a number of city-states centered around cities such as Ur and Uruk. These states controlled the surrounding countryside politically and economically. 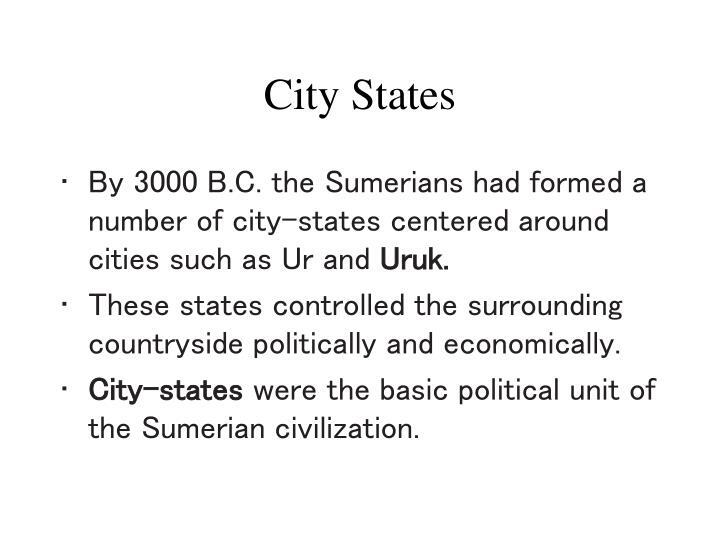 City-states were the basic political unit of the Sumerian civilization. 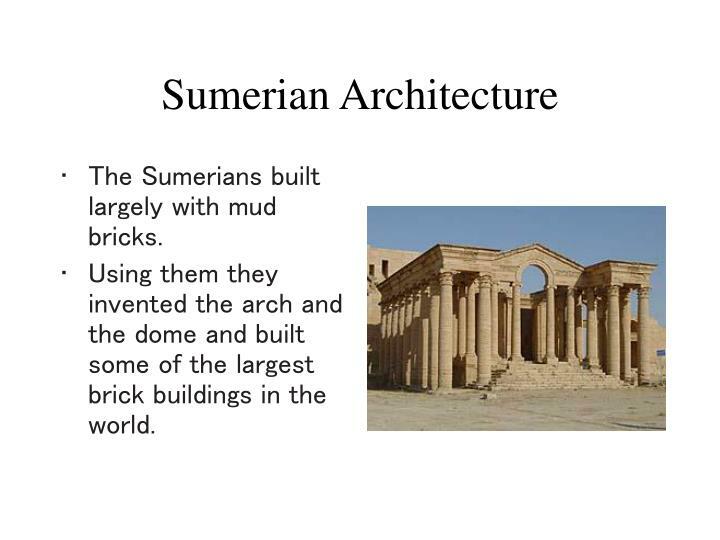 The Sumerians built largely with mud bricks. 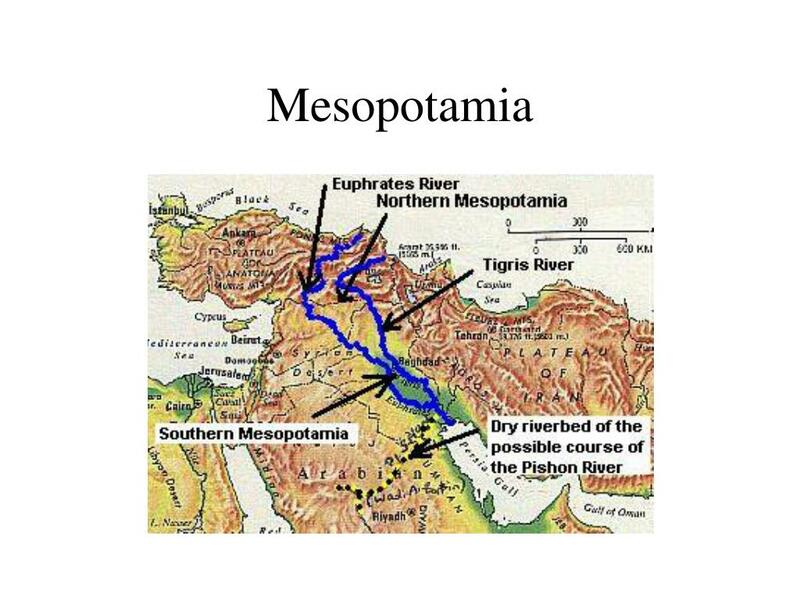 Using them they invented the arch and the dome and built some of the largest brick buildings in the world. 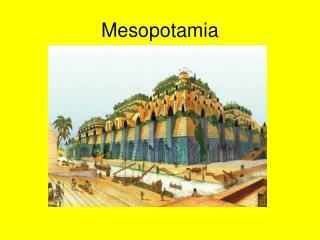 The most important building in each city was the temple. 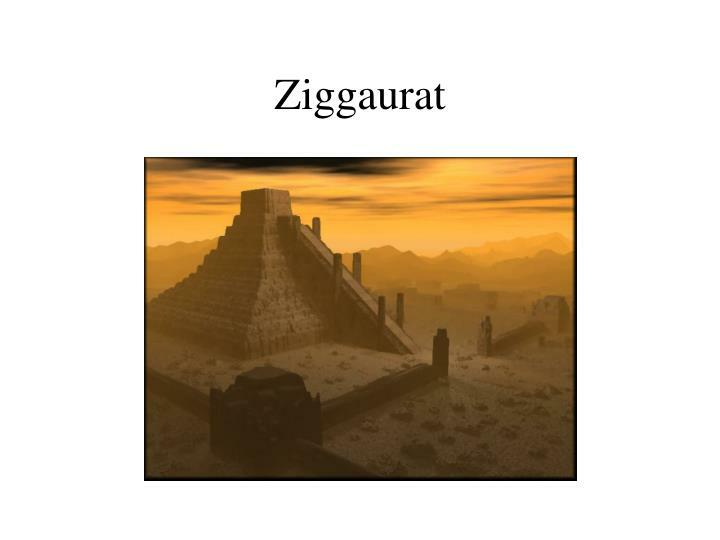 Often it was built on top of a massive stepped tower called a ziggurat. 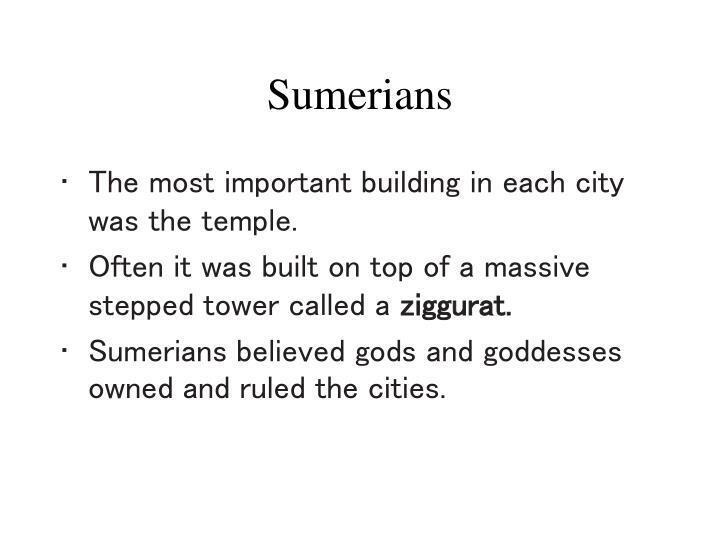 Sumerians believed gods and goddesses owned and ruled the cities. 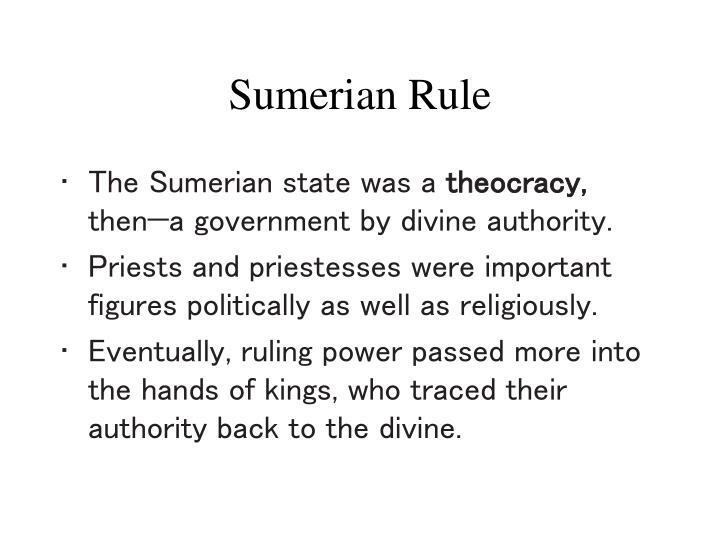 The Sumerian state was a theocracy, then—a government by divine authority. 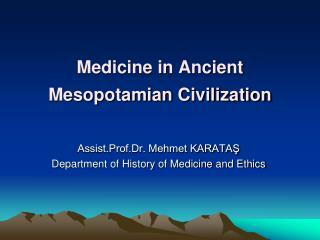 Priests and priestesses were important figures politically as well as religiously. 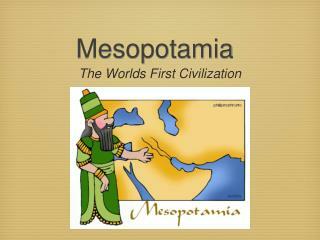 Eventually, ruling power passed more into the hands of kings, who traced their authority back to the divine. 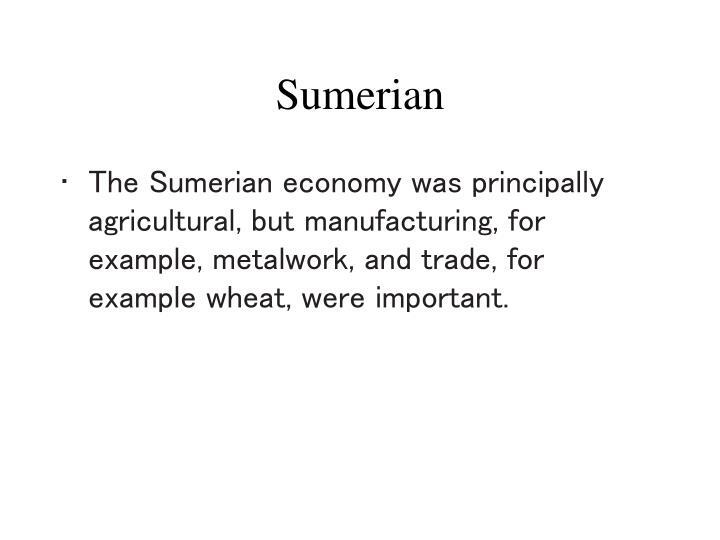 The Sumerian economy was principally agricultural, but manufacturing, for example, metalwork, and trade, for example wheat, were important. 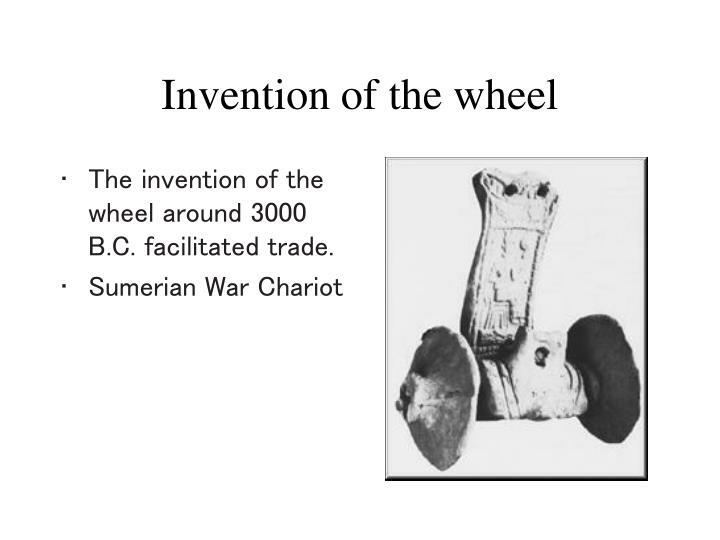 The invention of the wheel around 3000 B.C. facilitated trade. 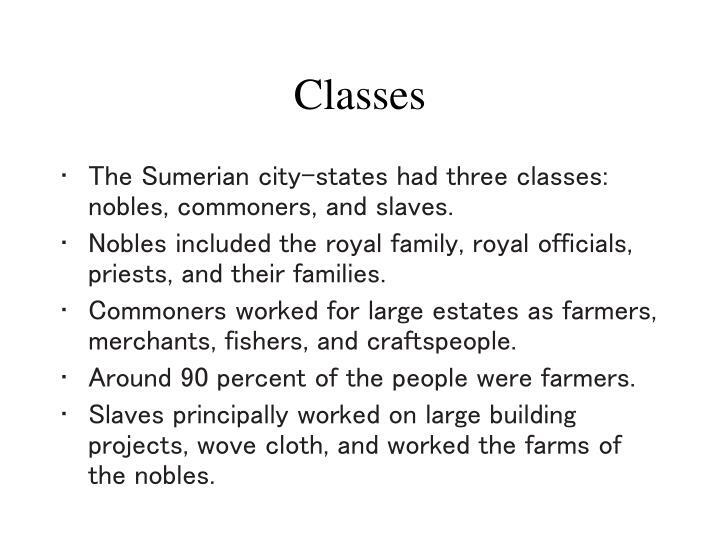 The Sumerian city-states had three classes: nobles, commoners, and slaves. 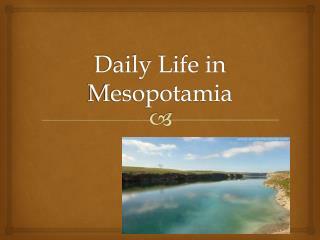 Nobles included the royal family, royal officials, priests, and their families. Commoners worked for large estates as farmers, merchants, fishers, and craftspeople. Around 90 percent of the people were farmers. 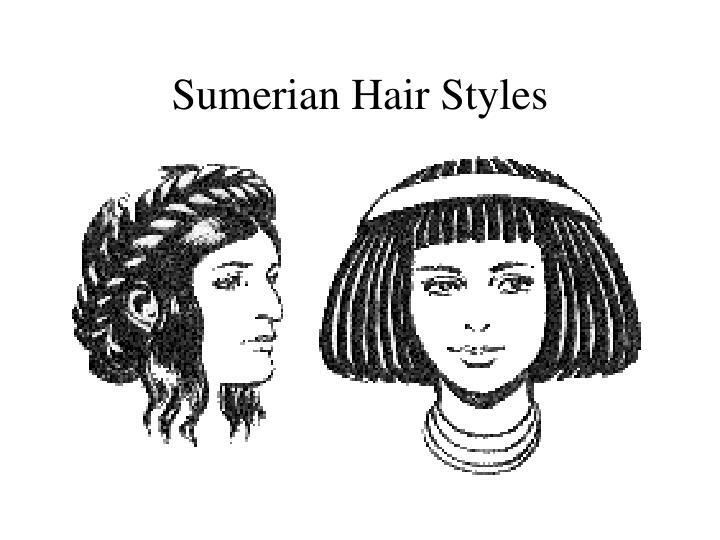 Slaves principally worked on large building projects, wove cloth, and worked the farms of the nobles. 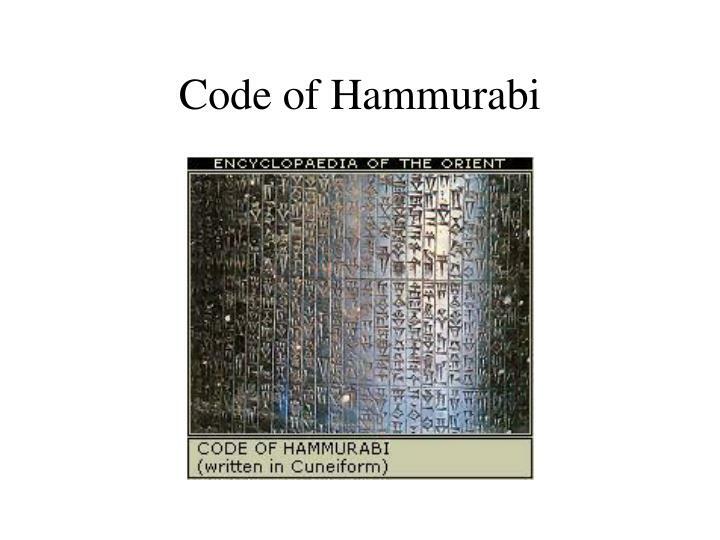 The Code of Hammurabi is one of the world’s most important early systems of law. It calls for harsh punishments against criminals. 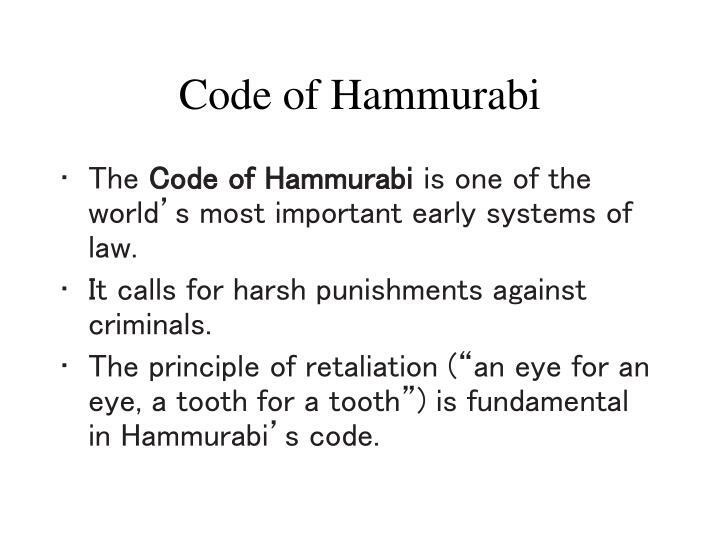 The principle of retaliation (“an eye for an eye, a tooth for a tooth”) is fundamental in Hammurabi’s code. Punishments varied according to social status. A crime committed against a noble brought a harsher punishment than the same crime committed against a commoner. 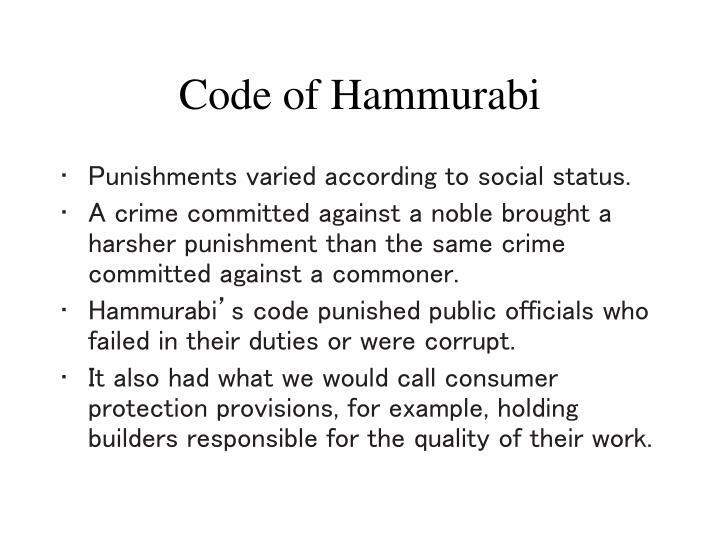 Hammurabi’s code punished public officials who failed in their duties or were corrupt. It also had what we would call consumer protection provisions, for example, holding builders responsible for the quality of their work. 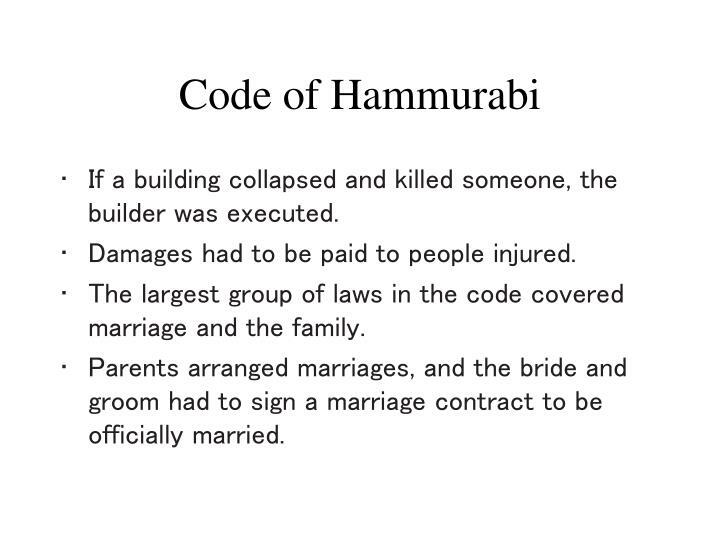 If a building collapsed and killed someone, the builder was executed. Damages had to be paid to people injured. 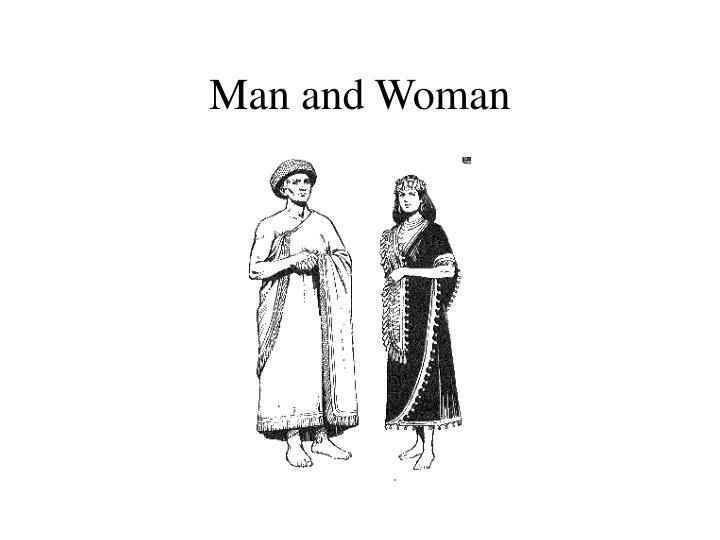 The largest group of laws in the code covered marriage and the family. Parents arranged marriages, and the bride and groom had to sign a marriage contract to be officially married. 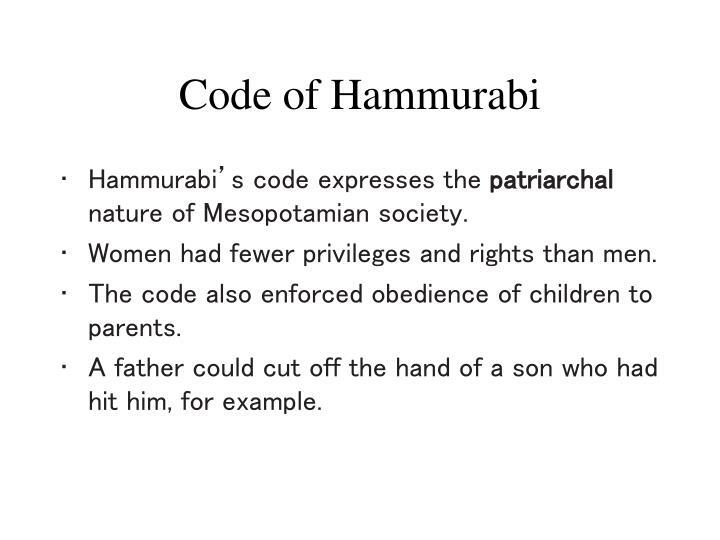 Hammurabi’s code expresses the patriarchal nature of Mesopotamian society. Women had fewer privileges and rights than men. The code also enforced obedience of children to parents. A father could cut off the hand of a son who had hit him, for example. Represents the south-east storm winds which brings disease. 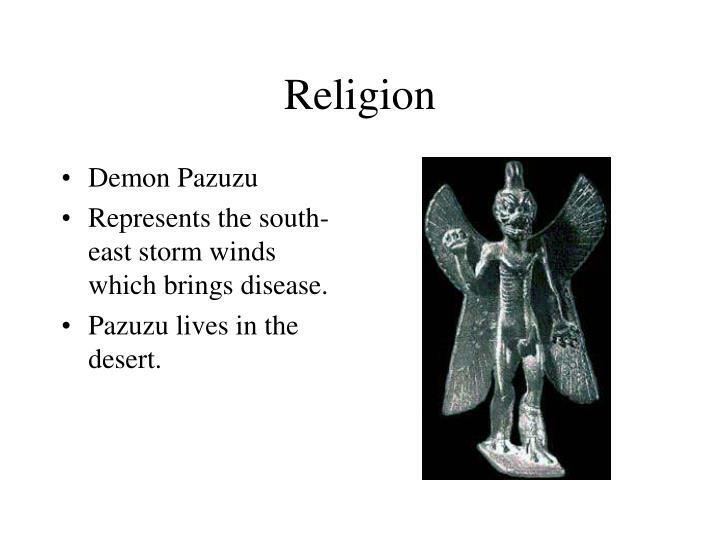 Pazuzu lives in the desert. 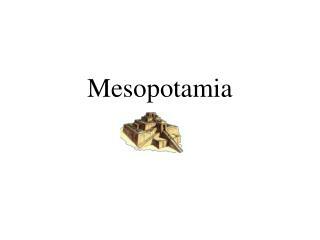 Due to the harsh physical environment and famines, Mesopotamians believed that the world was controlled by often destructive supernatural forces and deities. 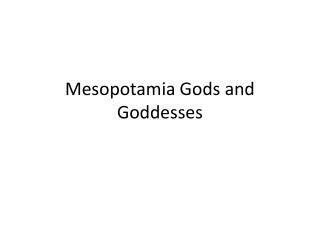 The Mesopotamians were polytheistic because they believed in many gods and goddesses. They identified three thousand of them. 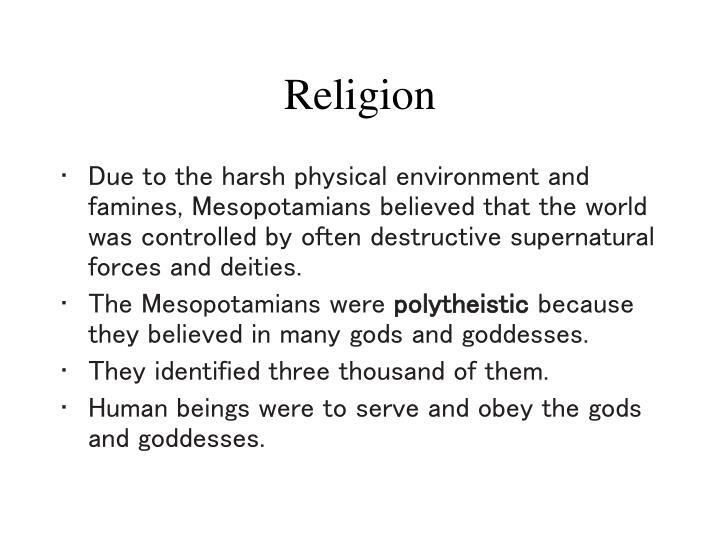 Human beings were to serve and obey the gods and goddesses. 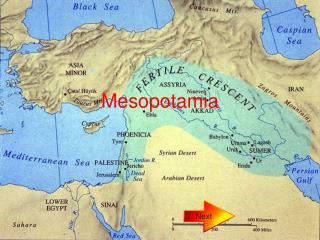 Sumerians believed that human beings were created to do the manual labor the gods and goddesses were not willing to do. 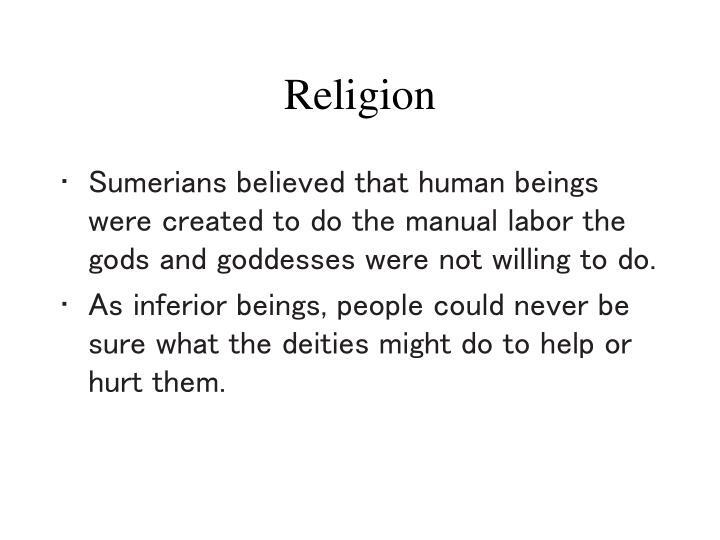 As inferior beings, people could never be sure what the deities might do to help or hurt them. 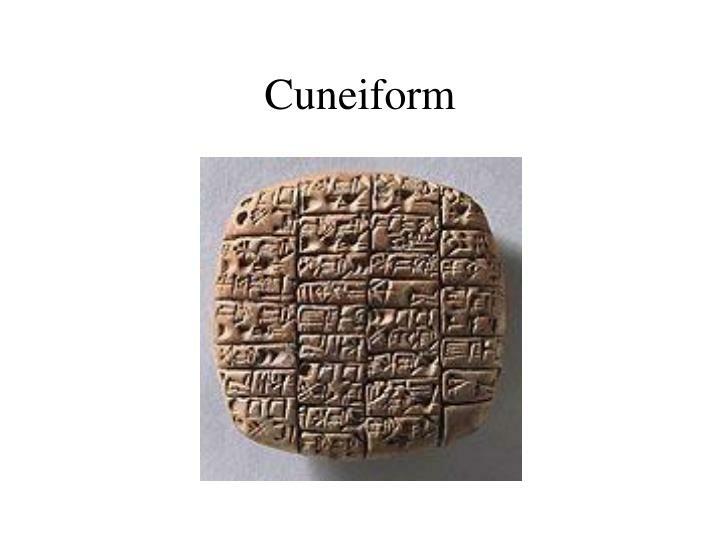 They created a system of writing called cuneiform (“wedge-shaped”). 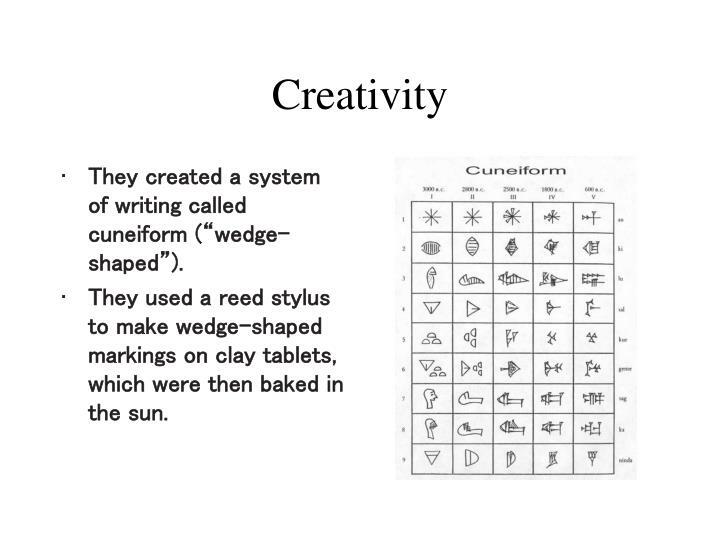 They used a reed stylus to make wedge-shaped markings on clay tablets, which were then baked in the sun. Writing was used for record keeping, teaching, and law. A new class of scribes (writers and copyists) arose. 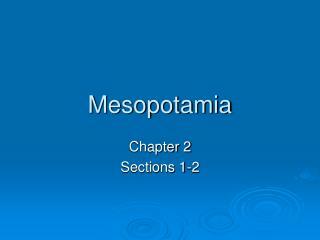 Being a scribe was the key to a successful career for an upper-class Mesopotamian boy. 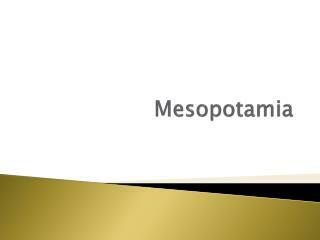 Writing also passed on cultural knowledge from generation to generation, sometimes in new ways. 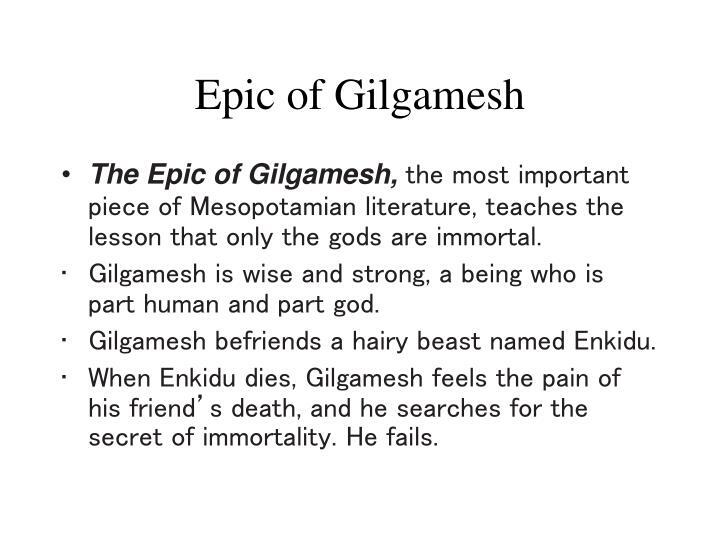 The Epic of Gilgamesh, the most important piece of Mesopotamian literature, teaches the lesson that only the gods are immortal. Gilgamesh is wise and strong, a being who is part human and part god. Gilgamesh befriends a hairy beast named Enkidu. 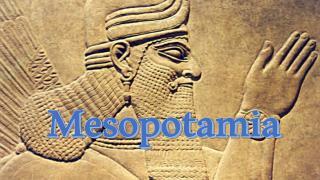 When Enkidu dies, Gilgamesh feels the pain of his friend’s death, and he searches for the secret of immortality. He fails. 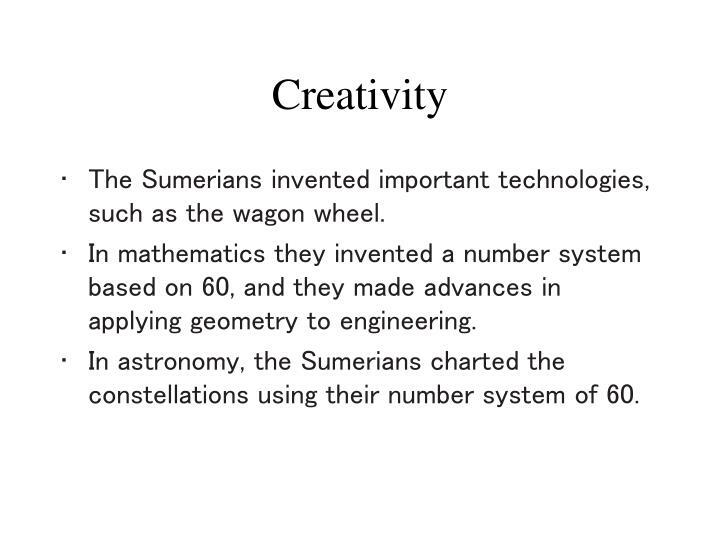 The Sumerians invented important technologies, such as the wagon wheel. 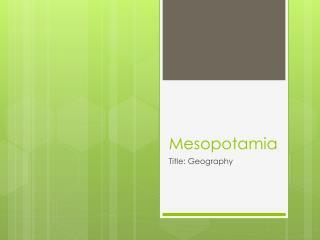 In mathematics they invented a number system based on 60, and they made advances in applying geometry to engineering. 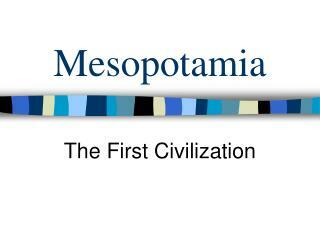 In astronomy, the Sumerians charted the constellations using their number system of 60. Mesopotamia Gods and Goddesses -. temples. 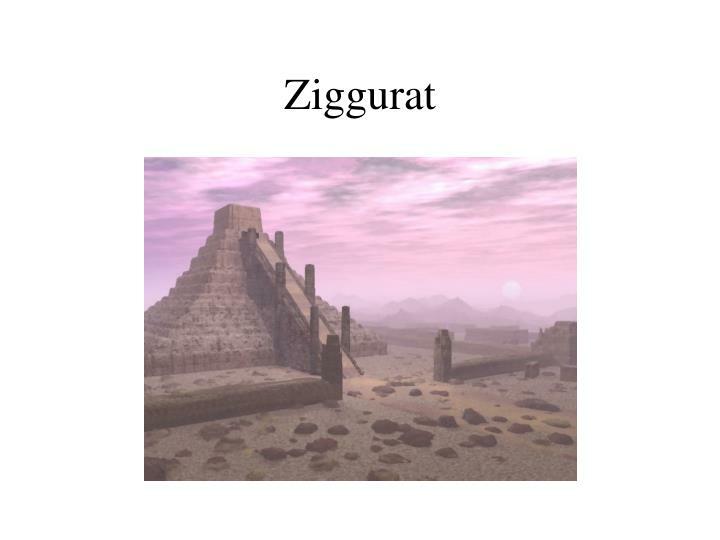 the mesopotamians built ziggurats ziggurats were big brick pyramids different from egypt (bigger) believed the gods and goddesses lived in the sky the taller the ziggurat the better. monsters. Mesopotamia -. 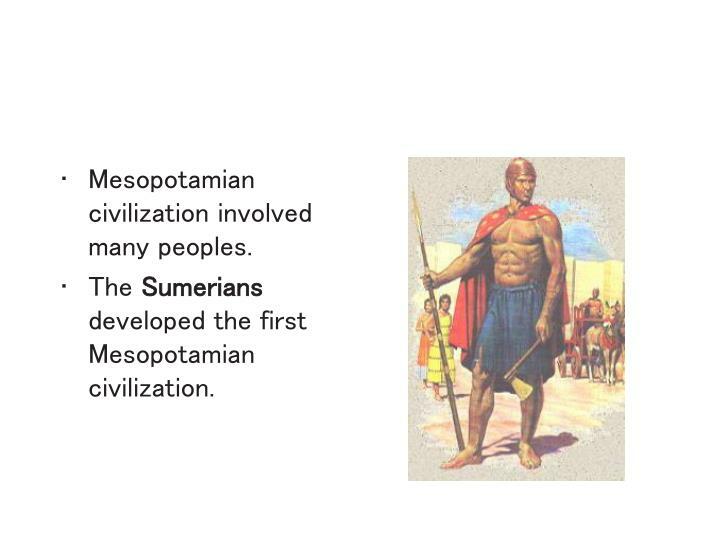 sumerians organized city-states – a form of political organization typical of mesopotamia civilizations; consisted of a city, and the surrounding agricultural areas that was ruled by an urban-based king.